The only thing that can make drinking quality cocktails in Vancouver more fun than it already is, is doing it in an over-the-top themed bar. It’s a good thing that Vancouver boasts a handful of stellar ones, and with very little theme crossover, you can step into a whole new world to enjoy a libation and some grub any time you want. Here are five epic and over-the-top themed bars in Vancouver. The Dark Manor Inn is Vancouver’s first-ever haunted bar. This spooky whisky bar offers patrons the chance to enter if they dare daily from 5 pm to close. Whether you’re after bourbon in a unique teacup or aiming to soak up the Haunting of Hill House-esque decor, The Dark Manor Inn is a must-try spot for daring Vancouverites and visitors alike. If you’re full of sin and don’t care who knows it, this seems like the place for you. Aside from its obvious Catholic church-inspired decor, Hail Mary’s offers a selection of eats including snack and salads. The bathroom here will literally take you to hell and back, and it’s an incredible selfie spot if you ask us. The bar also features a confession room, if you feel so inclined. Considering this brand coins itself as “Vancouver’s original new bar” it had to make our list, especially when you take its decor into account. With a menu of hearty pub staples, drink deals, and themed game and viewing night (Game of Thrones final season, anyone? ), there’s more than just crazy Sci-Fi decor drawing patrons to the brand’s two Vancouver locations night after night. This Twin Peaks-themed restaurant and bar serves its signature vegetarian eats and cocktails just a 15-minute drive down the road from the original location at 630 Kingsway. Head to The Black Lodge on Broadway to soak in the Pacific Northwestern outdoor decor, good food, and good vibes. 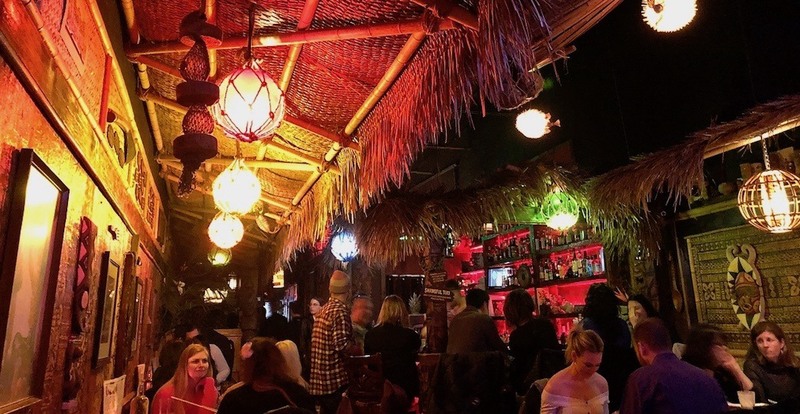 If you walk along Main Street you’ll eventually find a dimly lit exotic cocktail bar, called The Shameful Tiki Room. This hidden haunt is popular with locals and visitors alike, and it’s not just because of its unique atmosphere and themed decor. The drinks here are fire. There are no windows at this spot, so you’re going to have to go in and order these beverages for yourself to see them in their true epic glory.